Wild Wonders is an educational wildlife facility that provides exotic animals and animal trainers for educational programs. With many of their inhabitants being rescues, whether from abusive owners or challenging environments, Wild Wonders gives these animals a safe and happy home with plenty of interaction, with absolutely none of their animals being taken from the wild. Socializing their animals is a huge priority of Wild Wonders, both within their own species and with humans, as well. Every day, trainers personally see to the care and needs of each individual animal, taking them on walks, cleaning cages, and giving them undivided attention, much as they would their own house pets. Nutritional requirements are meticulously followed and each animal experiences affectionate behavioral enrichment, allowing them to feel comfortable around people. Through their tours, educational events, and exhibits, Wild Wonders allows the public to visit and interact with their animals on an extremely personal level. 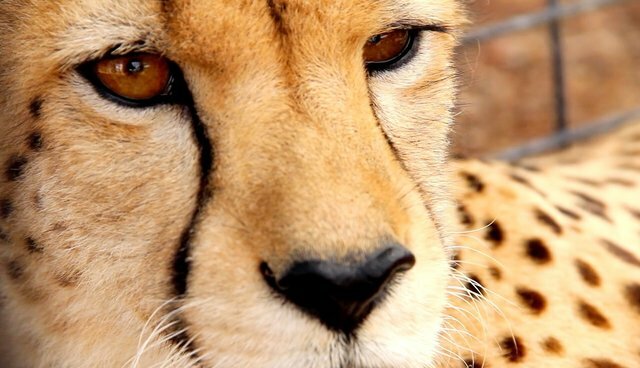 While zoos have their place, most do not permit for such an up-close experience with cheetahs, monkeys, and other furry, four-legged "creature teachers", as they are known at Wild Wonders. From Olivia the wide-eyed owl monkey clambering up your shoulder to having one of the whiskered bearcats slurp a banana from your palm, the experience is like no other. TriOdyssey, a web-based video production company, was able to get a hands-on experience with these animals in Bonsall, California – just north of San Diego. After paying them a visit, interviewing a member of the staff, and using a couple lint rollers to get the fur from their clothing, TriOdyssey sought to help out this incredible facility by creating a video experience to help people understand Wild Wonders' three-pronged mission: to rescue, education, and conserve. Jerry Sawitz, a wildlife artist based in Thousand Oaks, California, painted an original oil portrait of Masika, one of the cheetahs at Wild Wonders. In a creative partnership with Jerry, TriOdyssey started a fundraiser by offering his painting as a reward for potential donors, as well five, limited edition prints of his other work. Combined with the musical talents of Matlas and Tim Salazar, the video shows the process of creating the painting, as well as the inspiring experience waiting for anyone interested in visiting Wild Wonders. With no profits to be gained by TriOdyssey, Jerry, Matlas, or Tim, the team hopes to simply raise money to help support Wild Wonders, providing much needed food and care for their animals. Because so many of their staff are volunteers, Wild Wonders often rely on acts of kindness from the public and donations to keep them up and running. The team hopes to raise $2,000 over a period of two months, all of which will go directly to Wild Wonders. With recent outrages like Cecil the Lion, it is easy to grow angry at hunters and poachers – and rightly so. However, while showing your support through opinions on online forums helps strengthen the community, providing aid to facilities like Wild Wonders that help house and care for underprivileged animals is a powerful way to make a difference. By visiting www.igg.me/at/wildwonderscampaign, you can help TriOdyssey reach their goal. Every dollar helps, and even five-dollar donations will receive a perk listed on the site. Wild Wonders has also donated free tours of their own to be claimed by donors. Places like Wild Wonders would not exist without the constant support of the community. Asking for money is not something that is easy to do, but when it all goes to a good cause, it becomes quite a bit easier.